If you call a roofer, the roofer comes out, gives you an estimate and you either hire him, or not. Same with HVAC, plumbing, electrical and other construction professionals. But windows?? No, most come out to give you a dog and pony show. The tricks they use. The speeches they give. I can think of many things other than sitting through one of these spectacles that are more unpleasant, but....wait.....I'm having a hard time thinking of many. There is the display and presentation of the window. Ok, that's fine. It is good to see a sample of the window. There is the counting and measuring of the windows. That's fine. But, I've found that if the company asks you a ton of questions before booking the appointment or they REQUIRE that both the husband and wife be present during the visit, run. What that means is, there is a PRODUCTION in your future that both you and your husband will have to sit through. Bearing witness to this awkward exhibition is uncomfortable at best. One company we met with (I'll not mention their name. I have my reasons.) showed up with a big bag of tricks. Glass, screen, and frames deemed inferior shuffle to and fro. When you think your mind is going numb, out comes a heat lamp and a BTU meter so that you can really see just how inferior that "other" glass is. The sales person stuck to an awkward script and showed us videos of their installation and then a video of the owner claiming, "If we sign today...you get another 7% off!!!!" Even with all their supposed discounts, they wanted more than $900 per window! WHAT? As he said, they are proud of those windows. No kidding! The guy wouldn't leave us a written estimate because they put it on their "contract". And they can't leave you with a copy of that....for obvious reasons. Obvious reasons? What could those be? They are afraid their competitors will get hold of it. What? How crazy is that? Then they saved the best for last. If you sign their contract for the windows tonight and you find COMPARABLE windows for less within 30 days they will meet the price. So I said, "We already have. $594 a window and the window looks just like this one only it is a triple pane instead of a double pane." "That's not comparable," he replied. "Oh...of course! You told us that this window is exclusive to your company. So there is NO comparable window"
Silence. Then..."But we'll meet the price if you find comparable windows...." he insisted. Husband and I just look at each other, then at him and we see our conundrum. No need to belabor the point. Just move on. We witnessed dog and pony shows from several companies. It is exhausting. And it is way too expensive. So here we are with 18 windows that are in disrepair because no one touched them for 48 years. 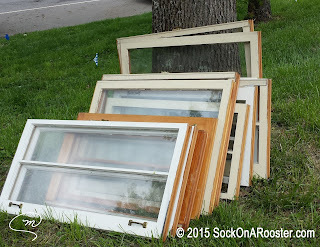 Reglazing them would be too expensive and would not provide adequate energy efficiency. Luckily, there is. If you are in the Nashville area, I highly recommend Builders' Window Supply. This is a family owned business that will treat you well. Ask for John Pritchard. Their windows are VERY affordable, even cheaper than all the other quotes we received. Moreover, they give an excellent warranty on the windows. They sell to the trade and to public. They are located on Sidco Drive in Nashville, TN. Save yourself a lot of time and trouble. Call them first (link above). We got all our new exterior doors, interior doors and 18 windows from them. They also recommended people to install the windows. We went this route so that our contractor would be free to do other things. They were in and out of our house in 1/2 a day. To install the windows, BWS recommended Forst Builders (Stew and Crew). After our experience we can recommend them as well. They also are hooked up with Tennessee Valley Authority EScore program. If you hire them, they are approved with the EScore program so you can easily have your inspection and get a rebate on the installation of your windows. It helps. Give them a call. Great work. Nice people. If your contractor wants to use Pella Windows, ask him to go through his channels to get you in touch with Shannon West with Pella Windows. He will come to the property and measure. Then he will give you a good price on the spot. Great guy. We were almost going to go with him, but Builder's supply was a much better price. Nice guy. Call him. Windows are important. Not only to keep the elements out and keep the house at a constant comfortable temperature, but also to help with THE VIEW. When we first looked at the house, I quickly realized that a couple of the windows that face the back of the house needed to be bigger. Forst Builders were able to accommodate. They enlarged two back windows so that I could enjoy the view from my office window. Thanks for that. I look forward to THE VIEW.